Hands-on time with Marvel's new kid-friendly co-op brawler doesn't just present a Lego-game alternative but suggests that Wolverine can wipe the floor with the Incredible Hulk. Not to be confused with Marvel Ultimate Alliance 2, the Marvel action-RPG coming this fall from Activision, Marvel Super-Hero Squad was shown in New York to be a lighter-weight more cheerful title. The new Ultimate Alliance is an all-platforms, tons-of-characters game based on the anguished events of Marvel's Civil War comic. Super-Hero Squad is a Wii/PS2/portable game based on a cartoon featuring short versions of Wolverine and friends. That doesn't mean Super-Hero Squad isn't worth a look. Marvel Super-Hero Squad is a co-op brawler that pits any paired combo of Wolverine, Hulk, Thor, Iron Man, Falcon or the Silver Surfer in a beat-em-up story that has them punching, kicking and throwing star-spangled shields at bad guys in order to save the fate of Super-Hero City, the place where these heroes hang out. It also features a battle mode that can involve up to four players using heroes and villains to bash each other silly. We played about five minutes of a co-op adventure mission set in a military base, trading off control of Wolverine and Captain America with a THQ rep. Controls were simple with a couple of buttons on the Wii remote for jump and attacks, a shake for a special move. 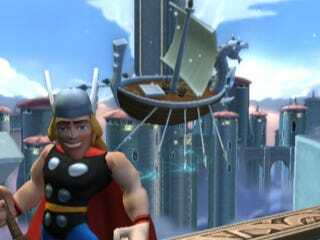 Then we battled that rep on a platform somewhere up in Asgard, pitting Wolverine against the Hulk. Regardless of who controlled Wolverine, the Hulk was toast. He's just too big, too dumb and too slow. The game is set for an October 20 release, which puts the game pretty far along. We played off a debug version. Camera: The game is different from the Lego games in two key ways. One, it doesn't have Lego pieces, and thus has far fewer collectibles. Two, it's not played from a fixed and mostly side-scrolling camera angle. Marvel is played with the camera trailing one of its heroes in more of a traditional third-person action perspective. That's fine for one player, but when we tried co-op, the camera did not zoom back and Captain America kept getting lost off-camera – only to have him awkwardly re-spawn into the battle. This is crucial. A bad camera breaks this game. A better one would make this a viable parent-and-kid co-op alternative to Lego. The Hulk: Seriously. This guy needs to find a way to beat Wolverine. In head-to-head battle mode, that clawed mutant could run circles around him, slice him up (no blood, of course), and knock him off an Asgardian platform with ease. The Hulk needs help. Spartan, Solid Design: Lego games are littered with pick-ups and power-ups. By accident or design, Super-Hero Squad appears to benefit from less of that distraction, encouraging attention to remain on the basic brawling. Cartoon Graphics: What we saw on the Wii was clean and colorful. Nothing too complex, but engagingly chunky versions of Marvel's heroes look right to us. Marvel Super-Hero Squad doesn't appear to be a deep game. And it's not for people who take super-heroes very seriously. But as light fare that presents its license with joy, it looks like a promising amusement for Marvel-loving kids and the parents who dare game with them. The game is set for October 20 release on the Wii, PS2, PSP and DS.